There is nothing more romantic than arranging a wedding. But there are so many things to think about. Cupcakecutie’s love to create perfect little wedding cupcakes, so that can be one thing to tick off of your wedding list. These are currently the highest culinary trend for the perfect modern wedding. Just imagine a beautiful tier of tasty and pretty cupcakes, a modern version of the traditional wedding cake. Each delicately decorated cupcake makes perfect confectionary and delicious treats for your wedding guests. The options are endless, we could even create an assorted selection or tailor them to match your wedding theme. Individual gift boxed cupcakes make perfect gifts for each of your guests. They also make perfect table decorations. So whether you want a full tier, singular cupcakes for your bridesmaids, or token gifts placed on your tables; we will create the package to suit. Have you joined the cupcake craze yet? I mean what is there not to like about them ? They are cute, extremely adaptable and so tasty. The magical world of the cupcake has created such a great buzz. As a professional singer I attend birthday parties, weddings, corporate events and charity balls on a regular basis. It appears that at every occasion the cupcake is most favoured culinary trend. It proves to be the fashion, the vogue of the moment and the ‘la piece de resistance’ of the party. All sizes, shapes, colours, and decorative treats create the perfect accessories for each event. Some quirky and fun, some colourful and creative, some pretty and intricate, some chic and modern. Every type has been covered. If you are organizing a charity event, a family fun day, a summer fete, a birthday party, a dinner party, a seasonal party, a wedding or just entertaining a few friends do not forget to join the craze and find your passion for the ever growing cupcake industry. No party is complete with out a selection of themed cupcakes. We are passionate about parties and would love you to share your party with us and allow us to create the perfect cupcake to match your party. Whether it is a special birthday, a childrens party, a sophisticated corporate event, your weekly dinner party or a friends hen party we will have the cupcake for you: Cupcakes are versitle and so much fun which makes them perfect for any party. Our childrens cupcakes are by far our most creative and playful . Children can enjoy our varied colours, shapes and sizes. The toppings are full of pleasant surprises; sprinkles of rainbow colours, jelly tots, hundreds and thousand,jelly beans,mini eggs just to name a few. We can supply many themed cup cakes for children,which include; fairies, superheroes, princesses, animals, football teams just to name a few. We can also provide educational cupcakes for parties, such as; alphabets,numbers and shapes. If you wanted us to create specific childrens names or ages we would be happy to do so. Please call 07960749851 with any childrens party ideas and we will be happy to create them for you. Your child and their friends can enjoy creating their masterpieces, and decorating their cakes with lots of flavoured icing and decorations. All edible icing and decorations will be supplied by us. Along with boxes to enable the children to take their creations home. All little party guests can enjoy making as much mess as they like and have as much fun as they wish. As the jelly tots, hundreds and thousands, chocolate sprinkles and rainbow coloured icing flow, their creativity and interactive fun will also. You can either sit back and relax or join in as much or as little as you wish. You will certainly be popular with the little ones as they will be having such a terrific time. Our cupcake parties are always a great success, the children enjoy them and so do we!! We are self contained and will tidy up all of the mess before we leave. We will supply all of the necessary ingredients. We will supply all the fun a children’s party should include. We are available evenings and weekends and our team are fully trained to work with children. All team members are CRB checked. Certification can be provided if requested. Special Offer : An extra tray of 10 cupcakes will be provide as a party gift to you. These will be vanilla flavoured and decorated with treats that your children will enjoy. Its come round again and it's fathers day. If you are anything like me you wont be able to decide what gift to buy. You want something unique, something he hasnt got, and something that isnt going to end up on top of his wardrobe for the rest of eternity. Why not show him you care with a cupcake. Ultra modern, ultra tasty and ultra personal. After all they do say to get to a mans heart its through his tummy. And with our delicious cupcakes he will not be disappointed. Our individual cupcakes will be perfectly packaged specifically for fathers day, and ribboned with a signature decorative bow. If the family are getting together for fathers day, it will be the most perfect gesture to bring a cupcake for all. Cupcakes are perfectly nostalgic for adults and put smiles on the faces of children so they are perfect for birthday celebrations. Our birthday cupcakes can be created with the personal touch for the special birthday boy or girl. They can be sophisticated or fun, thanks to the versatility of the cupcake. The special thing about cupcakes is that they are so adaptable and can be personalised to every detail. We can add names, ages or any other desired decorative treats that you may desire. Cupcake cutie's can provide individually boxed birthday cupcakes, which are perfect unique gifts or we can cater for the ultimate birthday party. We are happy to offer our cupcakes in our three cupcake cutie sizes and to any quantity you require. We offer a tier services if you wish these perfect treats to be a table decoration. If you want to be the hostess with the mostess..... you could impress your guests with the perfect dinner party cupcakes. If you were having a particular theme for your dinner party, we could design our cupcakes to match. From classy and sophisticated dinner parties to the fun and quirky, we will have a cupcake to suit. With an array of flavours and decorative treats the options are endless. 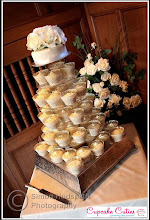 You could offer an individual cupcake to each of your guests, or we could offer a tier as the perfect table decoration. Please conatct us on cupcakecutie.kaley@googlemail.com if you wish to wow your guests with perfectly styled cupcakes. 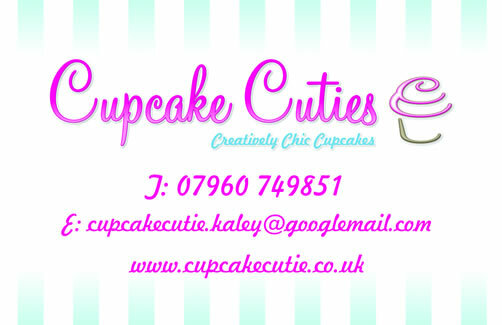 Cupcake Cutie , based in Bucks who are available for childrens cupcake parties. We will come to your party venue with ready made cupcakes for your children to decorate -- so no burnt little fingers. and lots of fun. The children can then enjoy creating their masterpiece's, making as much mess and having as much fun as they wish. We are self contained and will tidy the mess before we leave. All edible icing and decorations will be supplied - along with boxes so that the children can take their creations home. We are available evenings and weekends. Our team are fully trained to work with children and are CRB checked. Certification can be provided. An extra tray of cupcakes will be our party gift to you, decorated with treats that your children will enjoy.